Extensive metal detecting during the period 1996-2006 recovered a large number of objects. Finds included a Late Iron Age or Early Roman terret, Iron Age coins, Roman pottery and over two hundred coins, Roman brooches, part of a patera and two votive Roman objects and pieces of Saxon, medieval and post medieval metalwork. The quantity of Roman objects suggest some sort of settlement. December 1997 to March 1998. Metal detecting. Seven medieval and one post medieval coins. Roman brooches and seal box, patera fragment, votive stand (S2). One Roman and one post medieval coin. April /May 1999. Metal detecting. May to June 1999. Metal detecting. Site extended. Two Iceni, seven Roman silver, four Roman bronze, one medieval (Stephen) and one post medieval coin. Four Roman brooches, medieval and post medieval metal work. Might some or all the Roman silver coins be from a hoard? A. Rogerson (NLA), 24 August 1999. Ten Roman coins. See list in file. 1999 to 2000. Metal detecting. Nineteen Roman, two medieval and three post medieval coins. Roman and post medieval finds. A. Rogerson (NLA), 18 September 2000. Roman, Middle Saxon, medieval, post medieval and undatable metal finds. A. Rogerson (NLA), 25 January 2001. Roman, Early Saxon/Middle Saxon, Late Saxon (S3), medieval and post medieval metal finds. A. Rogerson (NLA), 21 May 2002. Ten Roman, one medieval and one post medieval coin. 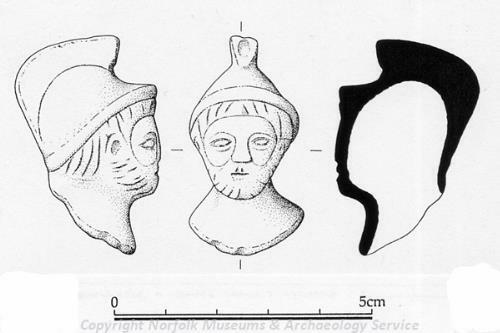 Roman and medieval/post medieval sherds. One Iron Age, fifty-two Roman, one Late Saxon, three medieval and three post medieval coins. Roman, medieval, post medieval and undatable metal objects. A. Rogerson (NLA), 14 April 2003. Two Roman, two medieval (both Henry I) and one post medieval coin. A. Rogerson (NLA), 25 May 2003. Three Roman, two medieval and one post medieval coin. Middle Saxon/Late Saxon, medieval and post medieval metal finds. A. Rogerson (NLA), 12 June 2003. Fifty Roman, six medieval and two post medieval coins. Roman, Middle Saxon, medieval, post medieval and undatable metal objects. A. Rogerson (NLA), 14 June 2004. Iron Age quarter stater, found at same time as previously reported finds. E. Darch (NLA), 9 September 2004. One Iron Age, ten Roman and one post medieval coins. One Iron Age and five Roman coins. A. Rogerson (NLA), 18 November 2004. A fourth Henry I cross fleury penny, in two fragments. This and previous finds submitted for consideration as Treasure. A. Rogerson (NLA), 24 November 2004. Roman, medieval (S4), post medieval and undated metal objects. A. Rogerson (NLA), 24 February 2005. Seven Roman and two medieval coins. A. Rogerson (NLA), 20 September 2005. (S1) added to file for Treasure Case 2004 T226, dispersed hoard of four coins. E. Darch (NLA), 8 December 2005. Unidentified Roman copper alloy object (S5) and a sherd of Late Saxon Thetford-type ware. A. Rogerson (NLA), 19 September 2006. Before 28 September 2006. Metal detecting. Thirty Roman and two post medieval coins. Roman metal objects including bust of Mars (S6). A. Rogerson (NLA), 3 November 2006. Two Roman, two medieval and one post medieval coins. Roman (S7), medieval and post medieval metal objects. Roman and Late Saxon pottery sherds. A. Rogerson (NLA), 13 January 2007. One of two Late Saxon stirrup terminals found March/April 2002 was re-identified as part of a 12th-century zoomorphic buckle compare examples from HER 13009, 29404, 29797, 32985, 37309, 50163 and 52777. A. Rogerson (HES), 23 April 2010. --- Photograph: 2002. KTG 20-22, Romano British kraftig profilierte brooch..
<S1> Unpublished document: Marsden, A.. 2005. Report for coroner. <S2> Illustration: Holness, A.. 1998. Drawing of a Roman rotive stool or stand.. Paper. 1:1. <S3> Illustration: Ashley, S.. 2002. 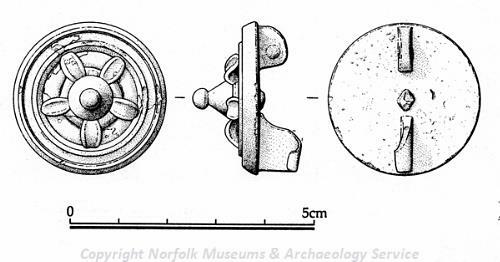 Drawing of a Late Saxon copper alloy stirrup terminal.. Film. 1:1. <S4> Illustration: Gibbons, J.. 2005. Drawing of a medieval mount from a belt or furniture.. Film. 2:1. <S5> Illustration: Gibbons, J.. 2006. Drawing of a Roman copper alloy unidentified object.. Film. 2:1. <S6> Illustration: Gibbons, J.. 2006. Drawing of a Roman figuring bust of the god Mars.. Film. 2:1. <S7> Illustration: Gibbons, J.. 2007. Drawing of a Roman gilt composite disc brooch.. Film. 2:1.